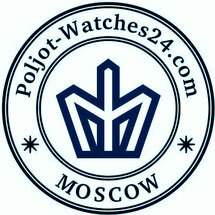 automatic movement 2426 by Vostok watch factory, 32 jewels, additional 24hr indication, shockproof, power reserve 31 hours. large screw-down crown in pos. "3:00"
automatic movement 2415.01 by Vostok watch factory, 31 jewels, shockproof, power reserve 31 hours. automatic movement 2416.02 by Vostok watch factory, 32 jewels, date, quick date adjustment, shockproof, power reserve 31 hours. metallic luminous hands, second hand in pos. "10:00"